– My favorite from this set is the sawtooth shirt made from dry finish tin cloth and oil finish tin cloth for the yokes and underside of the collar. 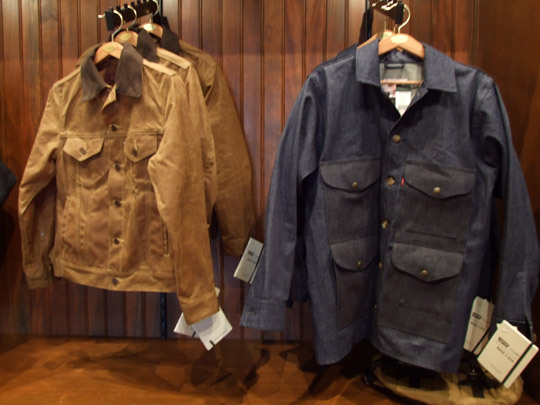 Unusual for a Filson, it fits very slim all around (sleeves, armholes, chest, everything) – if you intend to wear it as a shirt jacket, you might want to size up. – The hunting vest is great in its own quirky way. Slim fitting and made with a heavy denim, it is covered with pockets inside and out – size up if you’re going to wear it over a jacket. 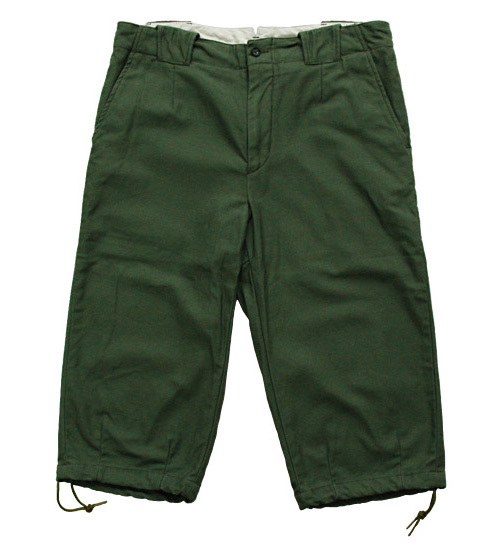 – The tin cloth pants in the 505 cut are also interesting, but not enough for me to buy them. I wonder why they didn’t make 501’s instead? It seems like it would have been the obvious choice, but maybe that will come in a later round. 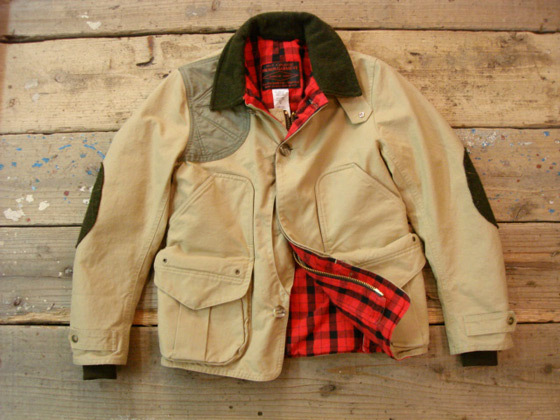 – The hunter trucker jacket is an odd combination. I didn’t try it on. 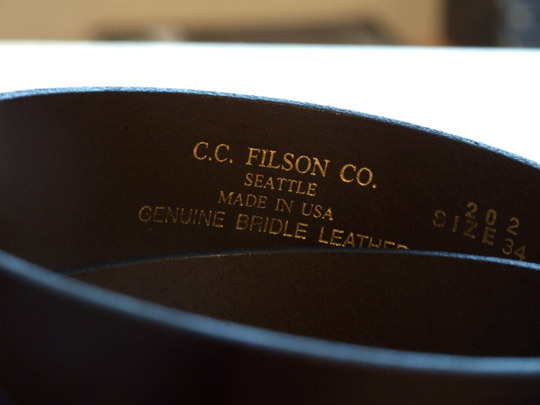 Filson’s bridle leather belts are among the best on the market, and at just under $50 each they are some of the most affordable. 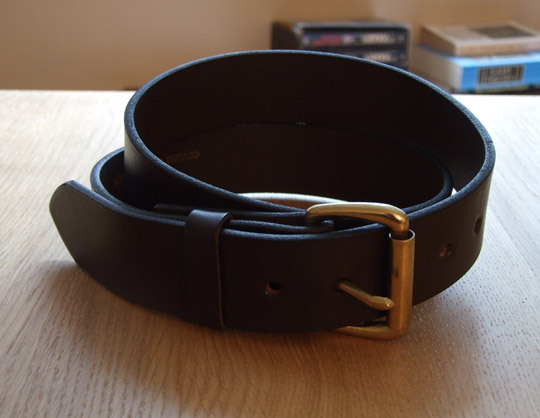 You can get them in any color you want, so long as it is brown with brass hardware. 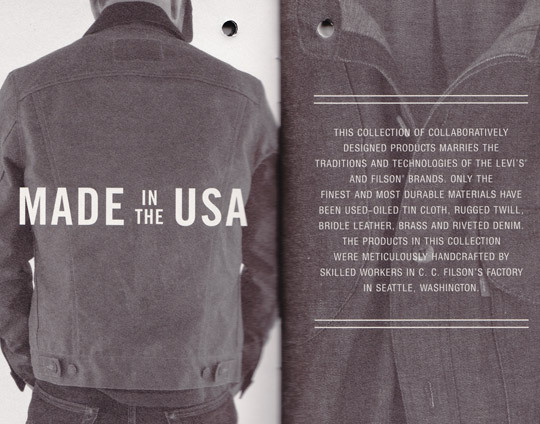 Still made in the USA. 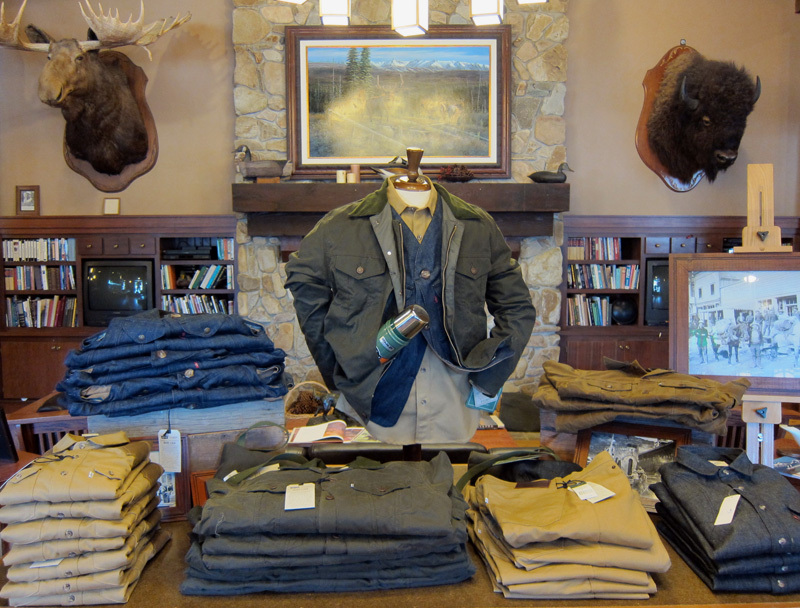 Not too long ago, Filson went on the record to say they weren’t going to do any sort of fashion line like Woolrich Woolen Mills, but instead would be looking at adapting some of their existing pieces to the younger crowds for this fall – if the new workwear line for Levi’s is what the CEO was referring to then it’s a great start. 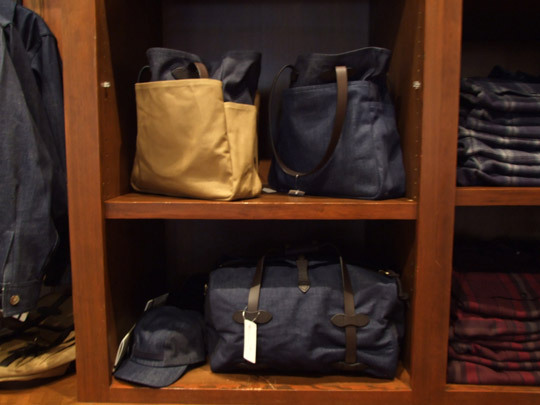 I was able to check it out in person today at the flagship store in Seattle and every piece is impressive and comes with the Filson guarantee. Even better, they’re not being shy on the ‘Made in the USA’ marketing. As for the pieces: the all denim cruiser jacket and upland shirt are less imposing in person and fit true to size (though still roomy), the hunting cap has a quilted interior with wool ear flaps to fold down for extra warmth, and I probably would have bought the twill/denim tote if I didn’t have too many bags already. 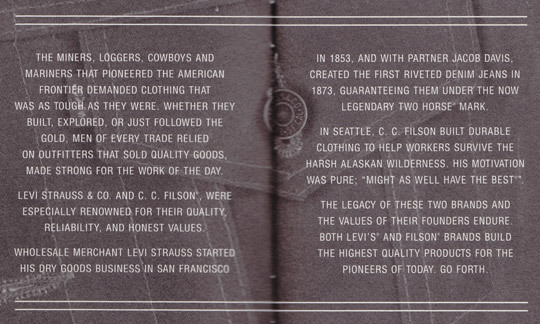 Everything is available for purchase at the Filson Seattle store and at various Levi’s locations around the U.S. – Update: It’s now up at filson.com and levi.com as well. 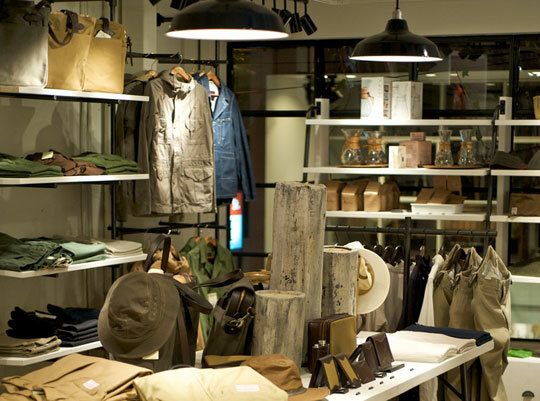 The news of the Levi’s workwear line by Filson led me their Japanese distributor’s website this evening, where I noticed that they’re now showing a bit more of the Filson Italy line along with some great pictures of the new Osaka store (conveniently located above a Champion sweatshirt store). I like that the interior design is completely opposite of the approach that the American stores take. Against my better judgment, I ended up ordering another pair of knicker shorts this season. I’ve come to prefer them when up in mountains as they allow for more freedom of movement and plus they flat out look cool. From Engineered Garments (the pair I just received). The cotton fabric is pretty thick and is the same type used in their fatigue pants. On Rakuten. First up, bags from Haversack. 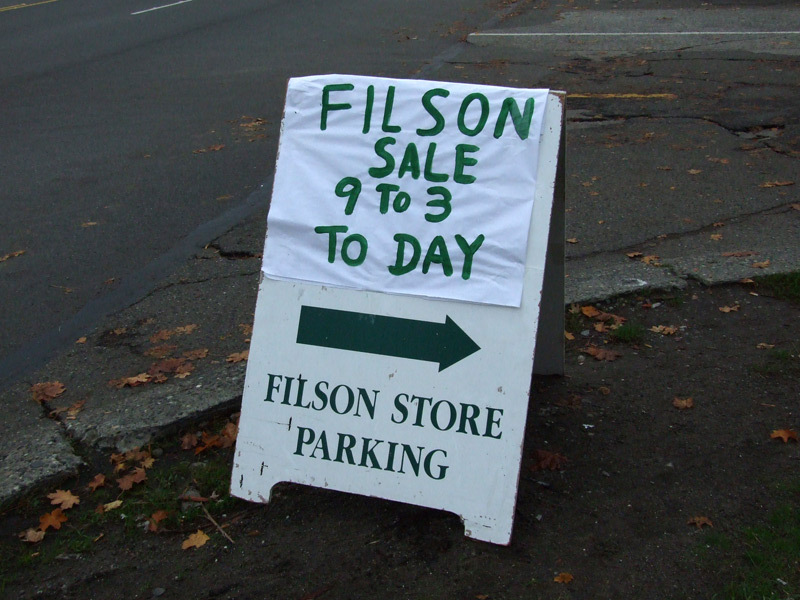 Thanks to the tip-off from Lesli, I was able to make it to Filson’s seconds sale this morning down in SoDo. A short one anyways. 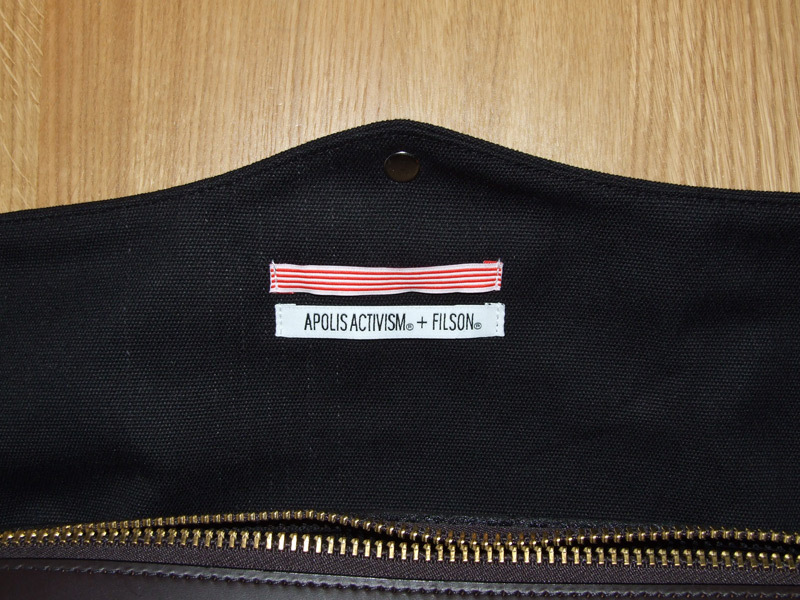 Last week I received the special Filson x Apolis Activism briefcase that I had ordered several months ago. I ended up not keeping it, which I’ll explain in a moment. Except for the fabric, it’s the same in every aspect as the regular Filson 256 model, and it even comes with several nice pencils. The fabric itself though was not as heavy as I was hoping it would be and it didn’t feel as strong, nor did it seem like it was treated. Overall it’s definitely a nice bag and would serve fine for daily needs, but if you need something heavy duty I would recommend getting the regular models instead. Update – Crane’s Country Store in Missouri has a few for sale on their website: Link. They’re great folks to deal with and they’re whom I order most of my Filson gear from. 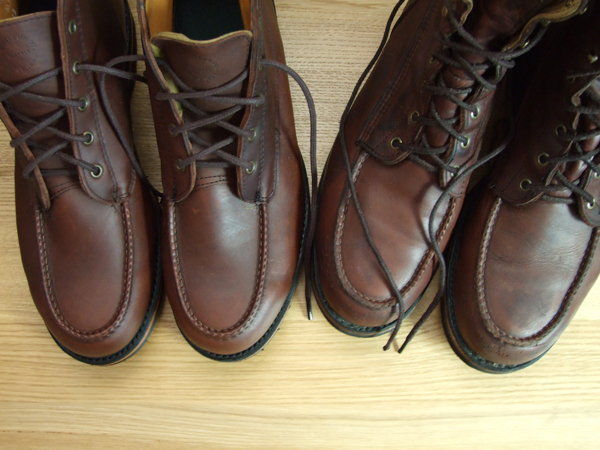 I was recently able to track down a pair of the older USA made Filson upland chukkas from a small store out in New England (I’m still working on a pair of the Highlanders). 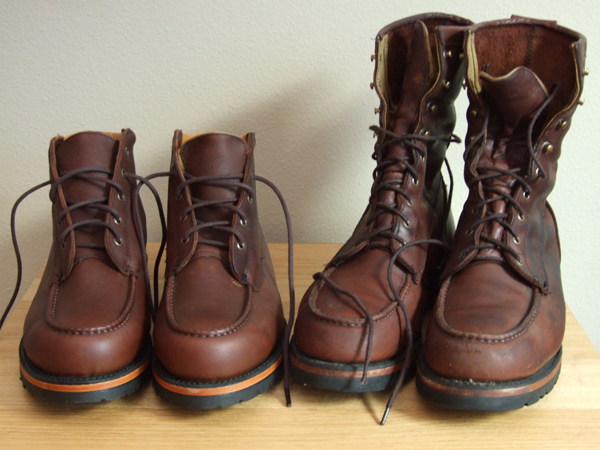 The upland boots to the right in the pictures below are my pair of choice to wear out in the field or in foul weather, and the chukka’s will be a good alternative for when the full boots would be out of place. The best thing about these is that the leather is very water resistant right out of the box.